The Fibonacci Spiral Model draws a geometric spiral whose growth is regulated by the Fibonacci series. Its growth parallels the rapid growth of the series itself. The golden spiral gets wider (or further from its origin) by a factor of φ for every quarter turn it makes. To produce a uniform distribution in the plane of the spiral, points are separated by the golden angle. This model is designed to test OSP 3D drawing implementations in EJS. The sprial can be drawn using the Simple 3D implementation that run using only standard Java. The Java 3D implementation of the library provides superior hardware-acclerated drawing of geometric objects such as spheres, but requires that the Java 3D package. This package can be downloaded from the Java community website. The Fibonacci Spiral Model was developed by Wolfgang Christian using the Easy Java Simulations (EJS) version 4.3.7 authoring and modeling tool. In this simulation, the number of points n can be adjusted with either the slider or the field provided. Similarly, the size of the points can be adjusted with another slider/field pair. The numbers on the points corresponding to the sequence in which they are generated can be toggled on and off using the checkbox on the top left, and a table showing the coordinates of each point can also be toggled with the checkbox beside it. 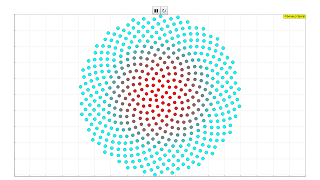 Do play around with the simulation to try to find the Fibonacci numbers hiding within!